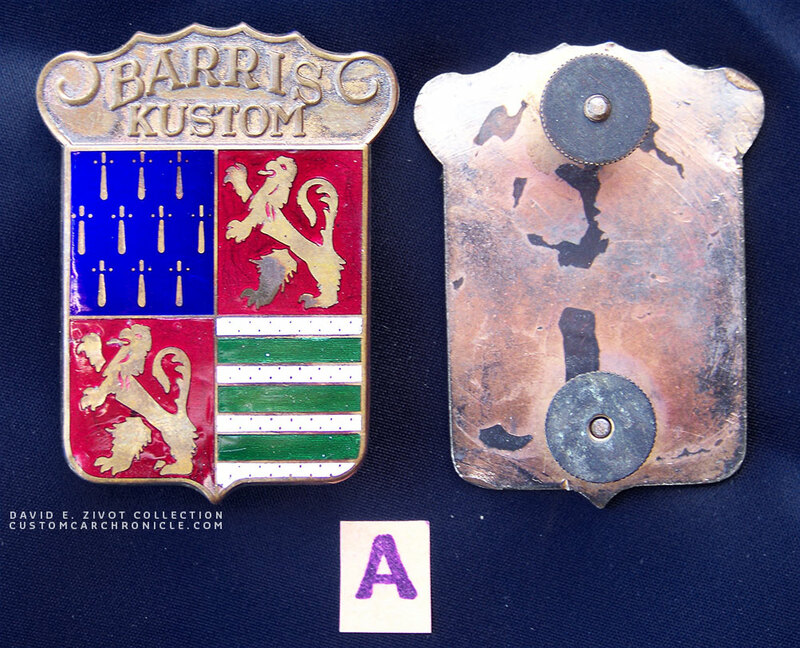 Preliminary Examination and Detailed Comparison Study of the Barris Kustom Coat of Arms Badge. 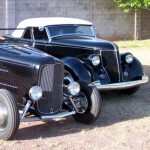 We recently did an article on the Custom Car Icon, the Barris Crest here on the CCC. Sharing all the information we have been gathering about these Crest in the past years. 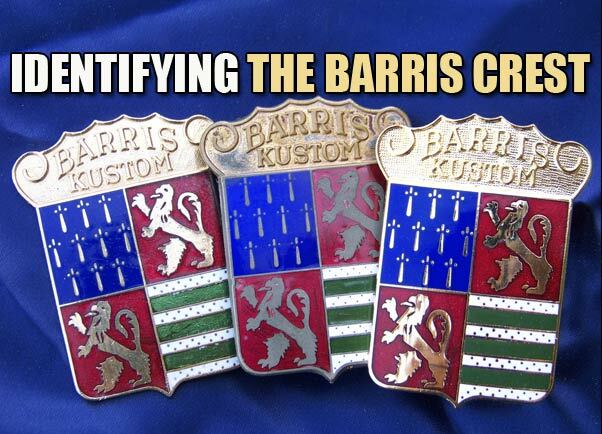 After reading the article CCC-Member and Custom Car and Hot Rod aficionado David E.Zivot compiled a Identifying the Barris Crests article based on his personal collection of Barris Crest. David has been so kind to share this information with us. I think it is important because so many fakes are being offered for sale on the internet, eBay, etc, that it would be beneficial to discern between vintage originals and modern remakes. As Rik Hoving so ably discussed, in the feature article on these iconic medallions of distinction, the exact date of introduction might be lost, 1952 being the most probable. 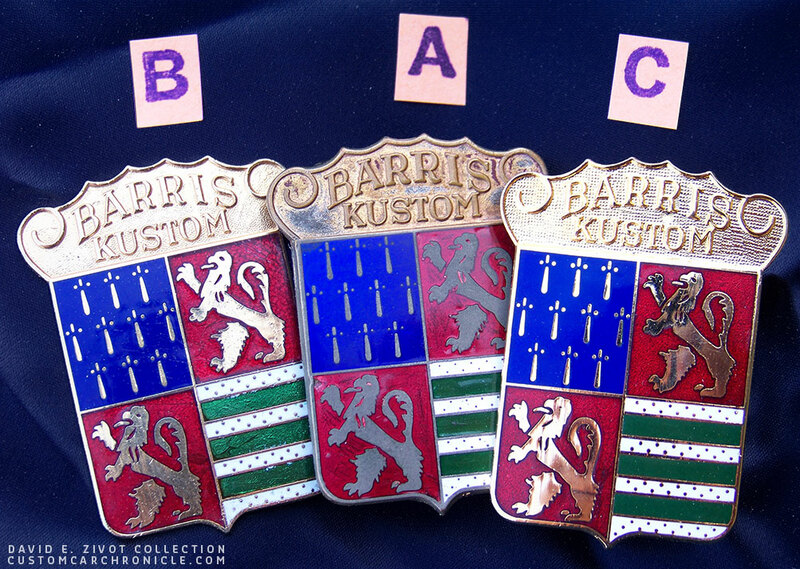 To whom the original design ought to be credited, as well as the details of the heraldic design, and its meaning and significance to the Barris family name, I will leave to further research. I will limit the scope of this exam to a detailed comparison between known original Barris issue pieces, and the newly made or reproductions currently available. This will serve to assist those who are seeking to obtain original examples, and wish to be informed about what to look for. I have deliberately made no reference to exact measurements of the original examples, so as to deter any potential counterfeiters from reproducing a “better” fake. As the original 1950’s issue pieces are quite rare and desirable today, be very cautious when considering a purchase. Example A – Original early production 1952-58. No manufacturers mark, non-magnetic base metal, high quality finish overall, finely serrated thumbscrew-threaded post attachment. Example B – Early K. McCormick reproduction. Very nice quality overall, correct spacing of mounting studs. Example C – Current modern reproduction as offered by Barris and other vendors. No maker. Lower quality non-magnetic base metal, non-original spacing of threaded attachment post, thumbscrews of inferior quality. Example BAC – Here we can examine the finer points. Original early production 1952-58. No manufacturers mark, non-magnetic base metal, high quality finish overall, finely serrated thumbscrew-threaded post attachment. Early K. McCormick reproduction. Very nice quality overall, correct spacing of mounting studs. Current modern reproduction as offered by Barris and other vendors. No maker. Lower quality non-magnetic base metal, non-original spacing of threaded attachment post, thumbscrews of inferior quality. Original is slightly thicker in construction. 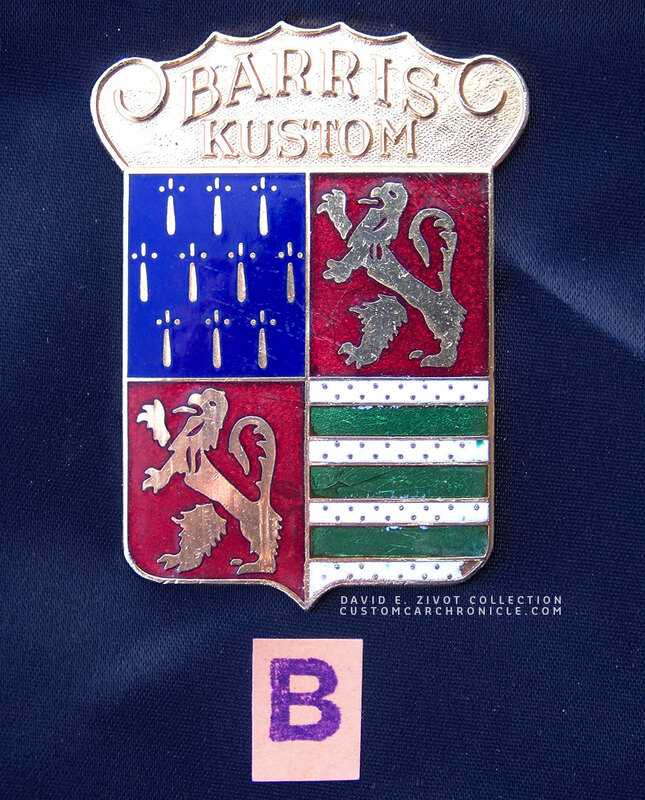 Crest of shield where “Barris Kustom” wording is has very fine almost indiscernible pebbling in background. Copies are deeply and coarsely pebbled. Cloisonné colors on original are quite distinct. The blue at upper left is lighter and somewhat pearlescent in color. The red sections are also slightly lighter in shade and no pebble background is seen beneath the translucent red. The green on white horizontal stripes at lower right show the most difference. The green has a semi-transparent effect with very fine horizontal lines showing through from the base metal. The small gold dots on the white lines are very tiny on the original. Also note that the gold plating or “wash” on the originals is lighter in shade and more matte in finish. The “Barris” and “Kustom” lettering on the originals are thicker, in higher relief, and closer together than the remakes. One can also detect the slight differences in the lions, and the swords on the blue section. Also the formation of the green and white horizontal stripes is quite different on the remakes. 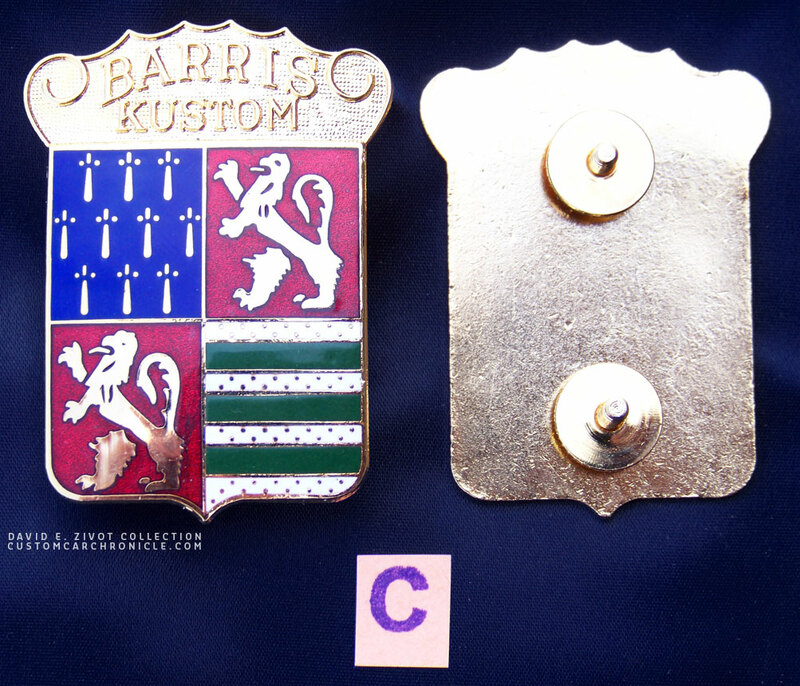 I hope this has been of interest, and perhaps some assistance in helping to identify the authentic Barris Kustom badge, from the merely derivative and counterfeit. The original crest “A” has smaller dots as handle of the sword, than both resproductions. The top right lion on the original crest “A” shows a differnt rear claw than the other two, which have a seperate “nail”. The front claws on the original appear to be crisper overall. Also on the bottom lion the lion seams to be a bit more crisp on the original “A”, and the top front claw looks to be slightly fatter than on the other two. Overall small differences between the original and the two replicas. The dots in the white section on the original crest “A” are a lot smaller than on the two replicas. The surface beneeth the green section on the original “A” appears to have very thin horizontal stripes for extra reflection. 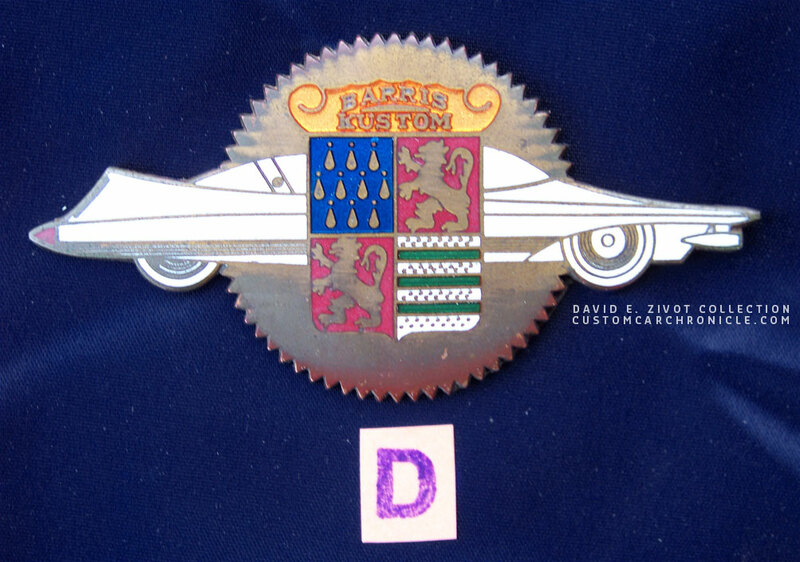 Example D – Original example of the mid-1960’s badge. Those I have encountered have no mounting studs, and show evidence of having been affixed with some kind of adhesive. Hi Rik and David ! Thanks for the in depth investigation in the intricate subject of Barris crest . 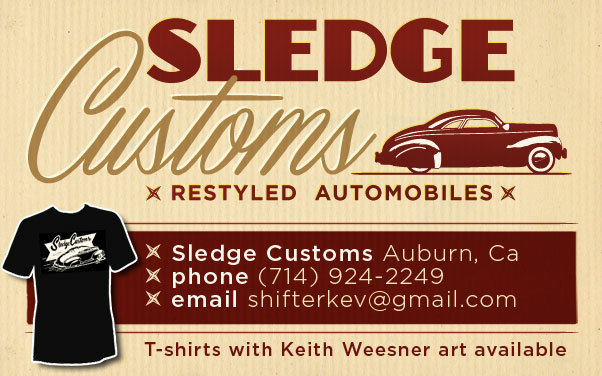 This is the level of investigation that several different areas of custom car building should be subject to ! These investigations needs to be saved for future generations to clarify whats what ! Nice write up on the crests. They are a very attractive item but I never noticed the difference so acutely. Good work David. Thanks for posting this Rik. Well article very interesting and a good history lesson. Wouldn’t the reproduction be a little smaller? Every time your reproduce a medal item it gets a little smaller.